I have to say, this one looks a little terrifying. Check out the photo to the right. This is an IVC filter. As with most things, when you first learn what the object is and what it is intended to be used for, you should think “Brilliant! What took so long to invent this thing?” The problem is, the IVC filter can move, turn, or break apart inside a blood vessel, causing all kinds of problems, including death of the patient. So let’s take a look at the product and the lawsuits that have resulted from the medical device. IVC is the acronym for “inferior vena cava,” which is the primary vein running from your lower body to your heart and which carries deoxygenated blood. (And just for completeness, the superior vena cava is the large vein carrying deoxygenated blood from the upper body to the heart.) The vena cava veins move this deoxygenated blood into the right atrium of the heart, where it can be oxygenated and sent back out into the body. Obviously the IVC is a vitally important vein inside the body, and when problems occur they can become serious and even life-threatening. Deep Vein Thrombosis (DVT) is one of those problems that can occur. DVT is a blood clot that forms in a vein. Often these blood clots originate in the leg or thigh. If the blood clot becomes loose it can travel through the inferior vena cava and settle in the lung, a condition called pulmonary embolism. I’ll get to that. Sitting for long stretches can cause DVT. Blood clots can form during lengthy surgeries (where your body remains still for a long period), or on a long plane ride, or while driving a car for a great distance. Cancer patients can also develop DVT. Pulmonary embolism (PE) occurs when the blood clot (DVT) travels to the lung and creates a blockage in one of the arteries in the lung. This condition is very serious. It can cause permanent damage to your lung, reduce the oxygen levels in your blood, which can damage other organs (suddenly starved of oxygenated blood), and if the clot is large, it can even cause death. The IVC filter is a small metal cone-shaped device which is situated in the inferior vena cava, usually by inserting it surgically through a vein in the neck. See photograph above. The filter allows blood to flow freely, but is intended to capture a blood clot moving through the inferior vena cava. When the IVC filter catches these blood clots, it has effectively prevented the clot from traveling to the lungs and has thus prevented the onset of pulmonary embolism. That’s a good thing. Once on the market, the filters became quite popular. It is estimated that 250,000 people have an IVC filter implanted each year, and that well over a million people have received the IVC filter in the last ten years. So What Went Wrong With IVC Filters? The IVC filter was designed with the idea that it would be placed at a specific location along the inferior vena cava and stay there. Unfortunately, the filters have been shown to migrate along the IVC, to travel all the way to the heart in some cases. A medical device with metal spikes does not belong in a person’s heart. Also, the IVC filters have been shown to break apart. As you can see in the photo, the filter is made of very thin metal spikes or fingers, and these spikes have broken off in some patients. Surgeons have removed IVC filters with one or many spikes missing, which means those spikes are floating somewhere in the blood vessels, lungs, or heart of the patient. In many cases, the IVC filter simply cannot be retrieved through surgery. The IVC filters can also rotate or turn, making them useless for capturing blood clots but also causing complications inside the blood vessel. There is much more to this part of the story, which I will write about in future posts. Two corporations have manufactured the majority of IVC filters on the market: C.R. Bard, Inc. and Cook Medical, Inc. Both companies (and their subsidiary companies) have been sued by hundreds of injured people. MDL No. 2570 IN RE: Cook Medical, Inc., IVC Filters Marketing, Sales Practices and Products Liability Litigation. On July 21, 2014, the first MDL was formed, involving Cook Medical IVC Filters. The Cook Medical MDL was situated in the Southern District of Indiana and assigned to Judge Richard L Young. You can check out the website for the Cook MDL by clicking the link above. The MDL involving C.R. Bard, Inc. was established on May 18, 2015 in the District of Arizona. The MDL is focused on C.R. Bard and its “G2” and “Recovery” IVC Filters. Judge David G. Campbell is overseeing the Bard IVC MDL. For more information on the Bard MDL, click the link. The cases in both MDLs generally allege defective design, misrepresentation in marketing, and failure to warn doctors and patients. If you had an IVC filter implanted and now face complications, call me: 919.546.8788. Note: Photo taken by user: BozMo URL at http://catesfamily.org.uk. Photo can be accessed here. Used with permission pursuant to Creative Commons License. Licensor does not endorse the author or this article. 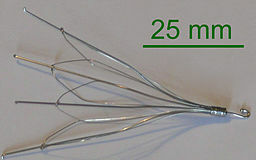 Photo is for illustrative purposes only and is not intended to represent any specific brand of IVC Filter.